FAIRFIELD — Melanie Marks is a professional genealogist and historic researcher whose work is so exemplary and thorough that she is often called upon by organizations and individuals to unearth facts about historic structures and families. This passion led Marks to establish her own business, Connecticut House Histories - although her work is not limited to Connecticut, and it led her husband Eugene Marks to purchase their own historical house back in the northernmost part of Fairfield’s Greenfield Hill in 2007. 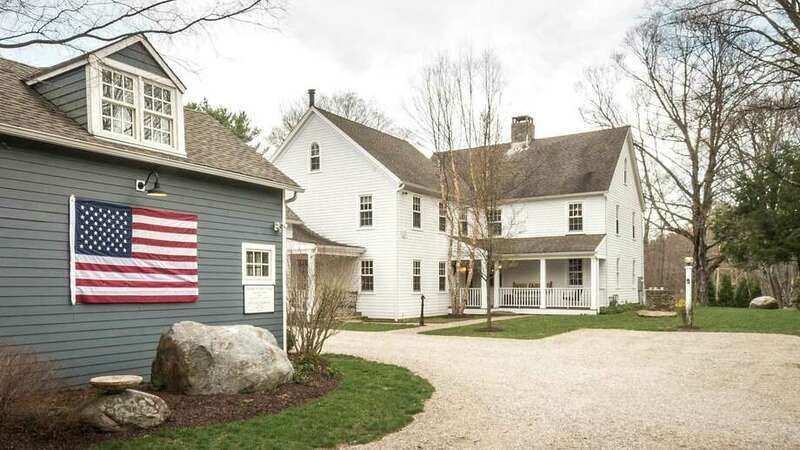 That updated vintage colonial farmhouse at 3808 Redding Road is on the market now as the couple prepares to move into another historic house they want to preserve, also in Fairfield. They have a second property in South Carolina where they created a mini replica of their Redding Road 18th century farmhouse. They also have a farmer, Janek, who grows vegetables and sells the produce to local farmers markets and restaurants. Janek is happy to continue farming the land with the new owners. And it might be wise for them to continue that arrangement. That farmland designation from the state gives this property a much-reduced tax rate. This is the perfect year-round home or summer or weekend retreat. The Marks honored the heritage of the house, built in 1769, and its property, from its earliest days as the Sherwood Family Farm to its 20th century use as the Witzke Farm and Boarding House, and created for themselves a home that feels historic and charming, yet a home that functions as a new and modern structure. It is a sophisticated country farmhouse that was rebuilt and modernized to fit into today’s lifestyle. The 4,318-square-foot house and the 538-square-foot guest cottage were taken down to their foundations and rebuilt in 2009, although many historic features were preserved. The exterior siding on the main house is high-grade cedar. During the renovation the fireplace chimney was rebuilt and given new flues. It also received new electrical wiring, plumbing, HVAC system, spray foam and fiberglass insulation, a tank-less hot water heater, wood clad tilt-in windows, and 40-year architectural shingles on the roof. The wood floors are a combination of newer milled red oak, antique maple, antique wide-planked chestnut, and white oak. The house is hooked up to city water but there is also a backyard well that provides water for the gardens and landscaping. The original well is in the front yard. Underground utilities mean there are no unsightly poles and wires to disrupt this picturesque property, the lion’s share of which is in Fairfield but an additional acre or so is located in the town of Easton. Nearby is the 186.9-acre Brett Woods Open Space with hiking and bridle trails so if the next owner had horses there would be no need to transport them elsewhere to ride. Horse and rider could trot to the trails. The original formal front entrance of the house is now a side entrance, where there is a formal English garden enclosed in a white picket fence. The main entrance is now on the other side of the house closer to the cottage and barn. It has a covered front porch and opens into a good-sized mudroom. Inside, the original part of the structure includes the Tavern room, formal dining room and study, each with a fireplace original to the house and exposed beams. A closet door in the Tavern room was reclaimed from the chicken coop in the early 1900s. The study has built-in bookshelves. The floors on the second level are a combination of the original chestnut and rare white oak. The master suite is in a separate wing and has French doors to a private balcony. There are four bedrooms in the main house and another in the cottage. The finished third floor has counter space, wall-to-wall carpeting and is currently used as an office. For more information or to set up an appointment to see the house contact Pamela Foarde of Al Fillipone Associates with William Raveis Real Estate at 203-257-9110 or pamf@afahomes.org.